Mary Elizabeth Winstead & Aaron Paul Getting "Smashed"
Mary Elizabeth Winstead and Aaron Paul will be strapping on their drinking shoes for a film that puts a new spin on a Blake Edwards classic. Winstead and Paul will star in "Smashed," reported Variety, about a hard-drinking married couple whose relationship is strained when she goes sober. Octavia Spencer ("The Help," "Dinner With Schmucks") will co-star as Winstead's AA sponsor, and the great Nick Offerman ("Parks & Recreation") will play the assistant principal where Winstead teaches. Gotta say we love the cast. We've been itching for Winstead to blow up for a couple of years now, Paul's greatness has been criminally hidden in the shadow of Bryan Cranston's work on "Breaking Bad," Spencer has been doing great work in supporting roles, and Offerman is, quite simply, the most talented mustache in America. The film, which is said to be a modern riff on the 1962 Jack Lemmon film "Days of Wine and Roses," will be directed by James Ponsoldt, working from a script he co-wrote with Susan Burke. 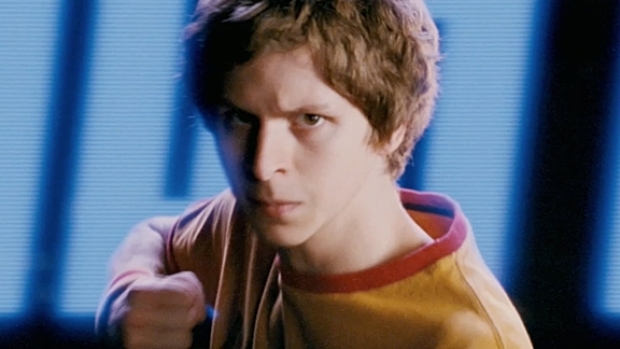 Starring Michael Cera, this comic-book adaptation from director Edgar Wright (Hot Fuzz, Shaun of the Dead) tells the story of a young man who must defeat his his new love's seven evil ex-boyfriends if he wants to keep her. Winstead will next be seen Oct. 14 in "The Thing," while Paul is currently starring in Season 4 of "Breaking Bad." Joel Edgerton and Elizabeth Winstead star in this re-boot/prequel of the John Carpenter horror classic about a team of scientist in Antarctica who discover an alien ice form frozen in the ice. Opens Oct. 14.